Today is National White Chocolate Day, so we are sharing some white chocolate recipes with you. 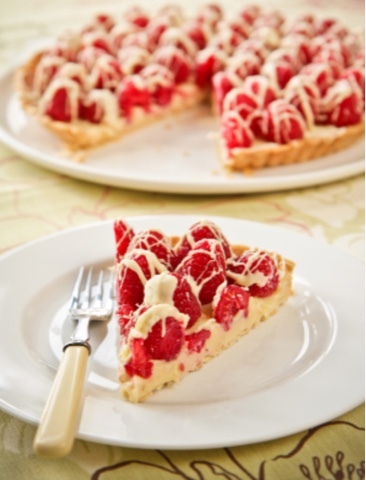 This recipe is from www.berryworld.com and white chocolate stars alongside delicious fresh BerryWorld raspberries. It looks amazing! NB. If you are short on time, use ready-made shortcrust pastry, or even a ready-to-eat pastry case. Make the pastry by whizzing the flour and butter in a food processor to form fine crumbs. Add just enough cold water to bring it together, just two or three tablespoons should do it. Wrap in cling film and allow to rest in the fridge for 20-30 minutes. Lightly grease a 23cm tart tin and roll the pastry into a circle big enough to line it. Don’t worry if it cracks a little, just patch it up in the tin using a little water if you need to stick it together. Prick the base all over with a fork, line with baking paper and baking beans and bake blind in the oven for 20 minutes until crisp. Remove the pastry case from the oven, take out the baking beans and allow to cool completely while you make the filling. Make the filling by breaking up 350g of the white chocolate and adding to a heatproof bowl, along with the double cream, butter and vanilla. Set the bowl over a pan of barely simmering water and allow the chocolate and butter to melt, stirring frequently until you have a thick shiny sauce. Pour into the baked and cooled pastry case and put in the fridge to set firm, about an hour. Once set, remove from the fridge and decorate the surface of the tart with the fresh raspberries, either in a pretty pattern or randomly, as you like. Melt the remaining white chocolate in a small heatproof bowl set over a pan of barely simmering water. Using a teaspoon drizzle the melted chocolate over the raspberries.